Every two in three parents find back-to-school shopping stressful according to a recent MasterCard survey. 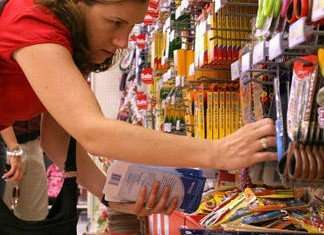 WhereParentsTalk.com spoke to with shopping expert Cathie Mostowyk, the founder, president and senior writer of the acclaimed Shoestring Shopping Guide about how to deal with back-to-school shopping blues. Why do parents find back to school shopping stressful? 1. Finding the time to do back-to-school shopping is tough when you are juggling kids, career and summer vacation. The MasterCard survey results indicate most parents spend approximately five hours doing back-to-school shopping and carving out this time can be difficult. 2. Parents want their children's first day back to school to be a good one. Accordingly – parents try to make everything as perfect as possible, right down to the outfit the child wears, the backpack that is comfortable, the right pencil case and of course the perfect lunch box or sac. Finding these items can be stressful if the parent has specific expectations and this can pile on additional stress. 3. As the survey suggests, parents spend up to $500 on back-to-school shopping and this can put pressure on the household budget which naturally can cause additional stress. What are your best tips for parents for back-to-school shopping? 1. Make a list first. Talk to your children beforehand to ensure your list includes key items that are important to your kids. It may be as simple as adding a water bottle in a specific colour or size or a new set of coloured markers that makes the list complete. It also means less chance of returns or duplicates. 2. Check last year's backpack before finishing your list. Chances are there are some perfectly good notebooks, pencils or other supplies that really don't need to be purchased this year. 3. Set your budget and discuss this with your children. If age appropriate, let them help with the budget. 4. If possible – shop solo. Take your children with you only if clothing needs to be tried on. You'll be more efficient and there may even be time for a coffee break! 5. Do some research online first so you are armed with more pricing information and can make better and more informed decisions. 6. Shop early in the week – Monday or Tuesday – when malls are less busy and the stores are well stocked. How can parents get their children involved in the process? Parents can get their children involved by sitting down with them and preparing the list together. Simply assuming you know what your child needs or wants is often a recipe for disaster. If you decide to take your children with you shopping, set aside enough time that the experience is a fun one rather than trying to rush through the mall. Sitting down for a quick lunch or snack with your children can turn the experience from a chore to an event. Let the children help choose the items and explain why the most expensive product is not always the best product. Show them how they can help stay within the budget. What is the key for getting the best back to school deals? The best deals are the ones that offer value – not necessarily the “cheapest” deal. Backpacks need to be sturdy and comfortable and the cheapest one is not usually the best choice as you'll find yourself replacing it halfway through the school year. Lunch sacs or containers are used every day, so invest in good ones. Many schools insist on “litterless lunches” so make sure you have enough containers to pack sandwiches, treats, drinks and fruit. As I have mentioned, do your research first either online or through flyers. Websites like mine at www.shoestringshopping.com can give you up to date info on sales.